This Severed Arm will really give you the extra length needed to reach out and touch somebody. But that is not all you can use this severed limb for, as it features a rather eerie and creepy appearance that makes it a great touch to any horror decor. This severed arm was removed just above the elbow, featuring blood-stained tatters of flesh at the site of the wound, as well as rough chunks of tissue that make the injury look like it was less of a clean cut and more of a violent tearing action. Even the bit of bone that sticks out from the stump looks like it was violent but clean break, rather than a surgically precise cut. Otherwise, though, the arm actually has a rather healthy looking complexion, although it does look a bit pale. 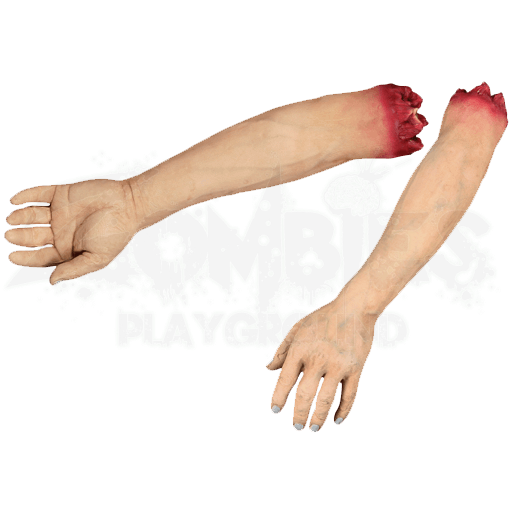 This severed arm is made from PVC plastic and measures approximately 18 inches long. With its lifelike look and size, this Severed Arm is definitely a shocking and startling piece that features a plethora of different uses whenever it comes to scaring others and inflicting maximum terror in others.